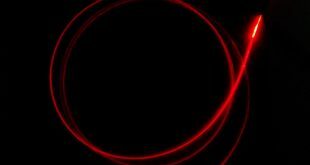 Today, at least for mathematicians and physicists, the word chaos has a rather precise and deterministic meaning. Chaos, or deterministic chaos, is the science that studies the great effects caused by small causes. Or, in more rigorous terms, it is the science that studies the dynamics of non-linear systems and, in any case, of divergent systems. Systems so sensitive to the initial conditions that their evolution over time (at least in a medium-long time) is, in fact, unpredictable. Deterministic chaos is, rightly or wrongly, one of the protagonists of the scientific and cultural history of the last decades. At least since when, in the second part of the century, it has established itself as a successful physical-mathematical discipline, which has produced remarkable results, both theoretical and practical. One of the first examples of deterministic chaos is the so-called “butterfly effect” discovered by meteorologist Edward Lorenz. The scholar realized that it is enough to slightly modify the value of only one of the many parameters that describe a relatively simple meteorological system, because the computer in a short time provides an entirely different and unexpected evolution of the weather conditions. That is enough to slightly change the initial conditions of the system because its evolution diverges. That of Lorenz was, in fact, a rediscovery, because even in the past the existence of unstable systems was well known also to the fathers of classical mechanics. The complex and non-linear systems actually are the norm in the reality that surrounds us : the motion of water in a river, the flow of atmospheric currents, the motion of the planets, the oscillations of a pendulum, the price trend in the financial markets are all examples of complex systems governed by the laws of chaos. In this post we want to show how even a simple circuit composed of inductance, diode and resistance constitutes a complex non-linear system and how easily emerge typical features of chaotic systems, such as bifurcations and the Fiegenbaum coefficient. In the context of nonlinear dynamical systems, chaos is a word used to describe the time behavior of a system that is aperiodic, and is apparently random or “noisy”. But, underlying this chaotic randomness is an order that can be determined, in some sense, by the very time evolution equations that describe the system. Even when it may sound paradoxical, such an apparently random system is in fact deterministic. Usually, chaotic behavior doesn’t appear without informing us when it is about to come. Generally, it all starts with a so called period-doubling bifurcation: system switches to a new behavior with twice the period of the original system at a particular value of a certain parameter. As the value of that parameter is further increased, successive bifurcations occur and the behavior of system takes a time period that is four times, then eight times and so on, finally ending in chaotic behavior. 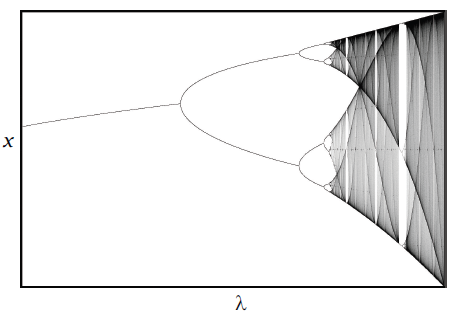 This behavior of a dynamical system over the entire range of a particular parameter is the bifurcation diagram, as the one depicted in the image aside. It shows a correspondence between the parameter values and the resulting response of the system. Every bifurcation indicates a successive period doubling and the response branches off into two. In the figure, as the control parameter λ is varied over a certain range, the response x takes different number of values: two values at the first bifurcation, four values at the second bifurcation, eight values at the third bifurcation and so on. The fuzzy bands indicate chaotic behavior. 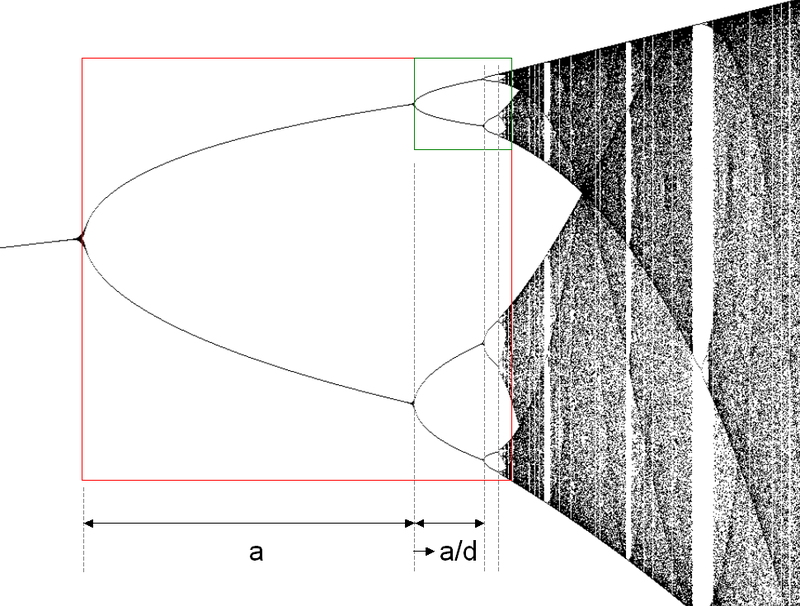 where λn is the parameter value at which the nth bifurcation occurs. Moreover, this ratio converges to a particular value–called the Fiegenbaum constant, as n approaches infinity : δ = 4.669201 . . . This constant indicates a very universal and a quantitative equivalence between apparently very different physical systems. 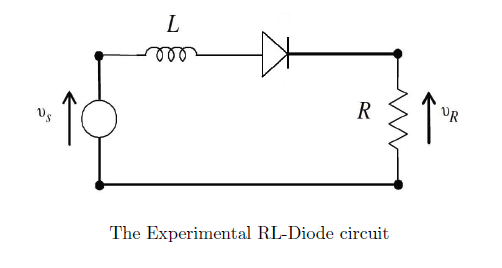 A simple RL-Diode circuit is going to be the subject of this experiment. Although it is a simple system, it exhibits interesting behavior including bifurcations and chaos. A series arrangement will be used as shown in the figure below. The circuit in the figure above will behave in two different modes: first when the diode is forward biased, the other when it is reverse biased. The applied signal is a sine waveform : Vsin(ωt) and the current in the circuit can be easily calculated in both the modes. However we must take into account an important parameter : the diode’s recovery time. The recovery time of a diode is the time a diode would take to completely stop the flow of forward current through itself as it moves into the nonconducting cycle. It depends on the amount of maximum forward current that has just flown through the diode. The greater the peak forward current, the longer the diode recovery time. 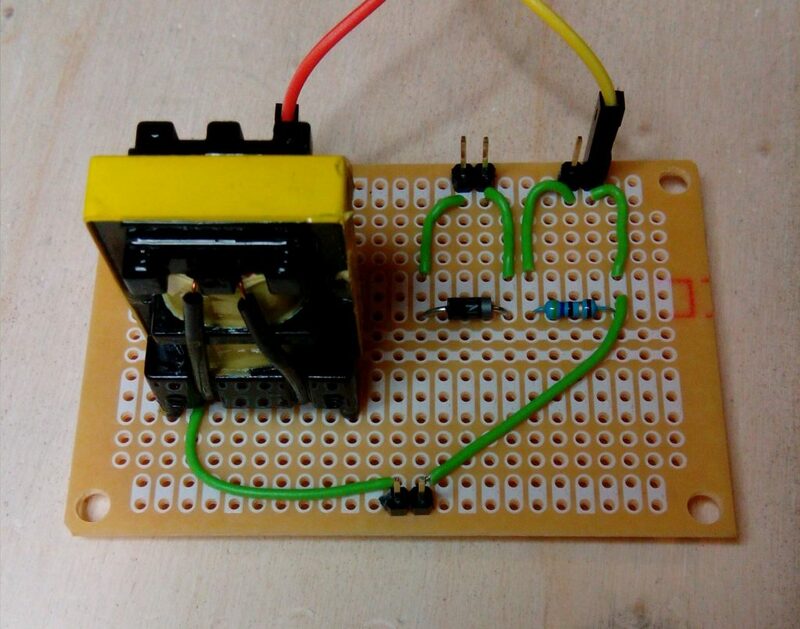 In the image below we can see the circuit we have used in the experiment. We start by feeding the circuit with a sinusoidal signal of low amplitude and low frequency and at the same time measuring the signal at the terminals of the diode with the oscilloscope, progressively increasing the frequency of the input signal until finding the value for which the signal on the diode is maximum: this is the resonant frequency of the circuit and allows us to determine the diode’s junction capacity. The subsequent measurements will be made using this frequency always. The graph below shows the trend of the current in the circuit (in blue) and the trend of the voltage across the diode (in yellow) against a sinusoidal input signal of period T. You see how the voltage on the diode, and the current has 2T period, this is essentially due to the recovery time of the diode with its non-linear behavior. 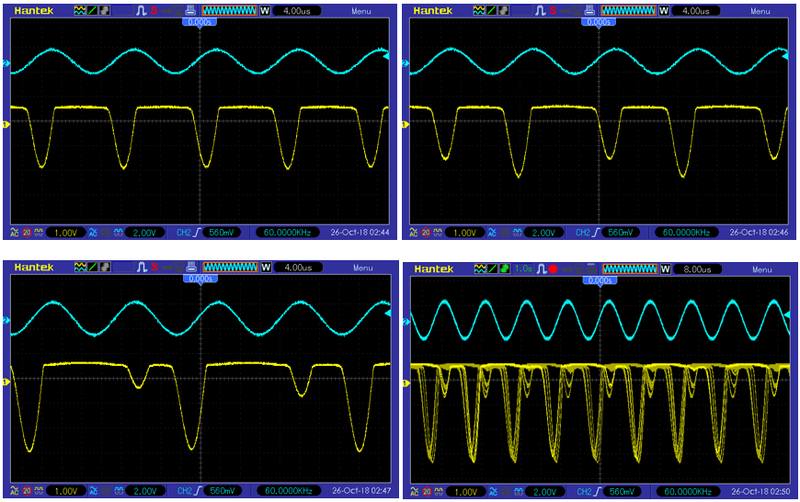 The image below shows the diagrams with the input signal (blue) and with the voltage across the diode (yellow). The first image shows the situation before the bifurcation, the second image instead after the first bifurcation. The third image shows the situation after the second bifurcation, with a periodicity of 4T, while the last image shows the situation in a chaos regime. The notion of state space (or phase space) is a very rich topic. In a state space the state variables, the variables that represent the state of the system, are shown. Usually these variables are conjugate variables (i.e. the position and momentum variables of the system) as the canonical coordinates for a state space representation. So, for a periodic system that obeys the law of energy conservation (e.g. a pendulum), the state space plot (phase portrait) will be one closed loop for a particular set of initial conditions. For a chaotic system, there will be many distinct loops in a phase portrait, showing that the system is aperiodic and does not approach a stable trajectory. With our circuit you can easily observe this with the oscilloscope, using the X-Y visualization of the input signal and the signal at the ends of the diode. The image below shows the system before and after the first bifurcation. An alternative way of analyzing the system is the frequency domain (Fourier). The images below show the frequency spectrum of the signal on the diode before and after the bifurcation. Before the bifurcation there is only the main peak at 60 KHz, after the bifurcation also appears the half-frequency peak that corresponds to a 2T period. When chaos occurs, the Fourier spectrum tends to show a set of peaks on many frequency values, as shown in the image below.